We have come a long way since our first prototype! This is the nft portion of the hydroponic system we first worked with. 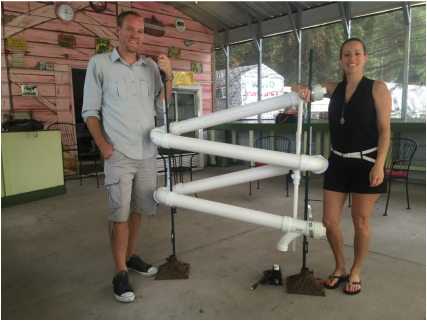 While we still use it, we have now incorporated new recycling components, A-Frames, grow-boxes, grow towers, trees... and we can't wait to keep exploring new design ideas! . 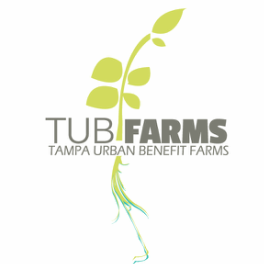 a school TUB Farm provides a wonderful educational opportunity to learn about innovative agriculture, designing grow systems and how to become civic minded members of our community. Hydroponics is essentially soiless growing using a nutrient rich water source. The use of hydroponic growing methods has come a long way, and today we can grow high yielding crops with dense nutrients in a fraction of the space. Hydroponics allow people to grow food in areas where it would otherwise be impossible. Since a hydroponic growing system often utilizes vertical space, the same amount of crops can grow on only a fraction of a traditional tract of farm land. Hydroponic systems only require around 10 percent of the water necessary for soil based farming, and often use little or no pesticides. The ability to use less space for higher production is why installing a TUB Farm directly at pantries and schools with space constraints is so beneficial. Hydroponics is the fastest growing sector in agriculture worldwide, and is especially useful in areas that have issues with drought. Hydroponic farming is an exciting educational opportunity for our students to explore as they also learn the importance of eating healthy and giving back to their own community. The TUB Farm system also gives our students the opportunity to explore the intersection of science, math and technology with the timeless activity of growing our own food.